Nicole in front of the pink bungalows at 29 Palms Inn. All photos courtesy of Nicole Najafi. 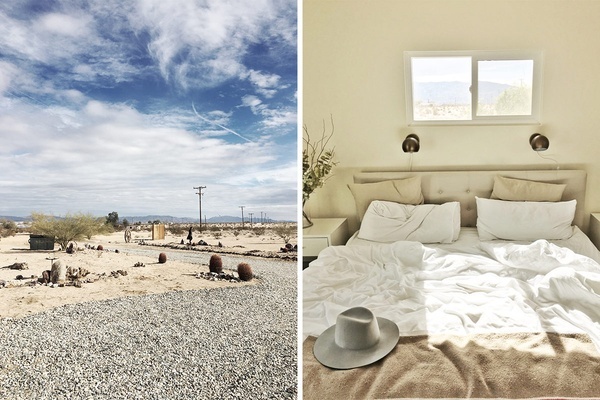 Nicole Najafi, New York-based entrepreneur and founder of denim line Industry Standard, just returned from a dreamy month-long stay in Joshua Tree, California. So, what brought you to Joshua Tree? I wanted to escape the winter and experience the peace and solitude of the desert after a crazy year. Blockshop Textiles has a good, succinct Joshua Tree guide on their website that was a great starting point. Per their recomendation, Joshua Tree Saloon ended up being my jam. I was a short-term regular during my month-long stint in town. My friends and I joked that it's the best restaurant in America because it's so cool and everything on the menu is good. I flew to Los Angeles, rented a car at LAX, and drove straight out to the desert with a brief stop at Carl's Junior on the way. The Palm Springs airport is much closer, but I'm a sucker for Delta. Los Angeles is about two-and-a-half hours away without traffic and Palm Springs is about 45-minutes away. I rented Casa 29 Palms in Twentynine Palms, a town just next to Joshua Tree, for one month, and visited other towns in the area, including Pioneertown, Yucca Valley, and Desert Hot Springs. I found the home on Airbnb and highly recommend it. It's very reasonably priced. The house is modern and cozy. 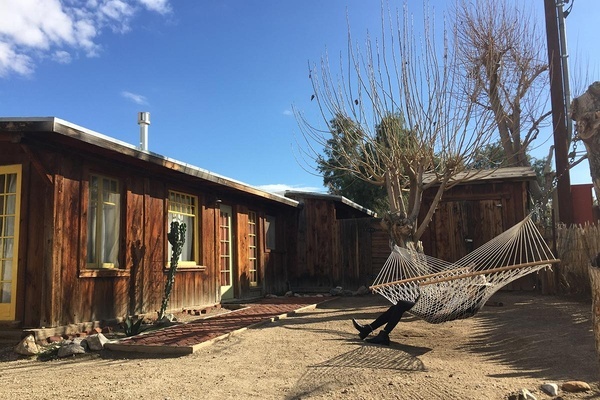 It felt like an oasis in the desert — there's a hammock, fire pit, and spiral staircase to the roof, where I would eat quesadillas and watch the sunset. It was a dream. Hanging out at 29 Palms Inn. From left: The front yard at Casa 29 Palms; a bedroom at Casa 29 Palms. Country Kitchen is a diner straight out of Twin Peaks. They literally have the best diner breakfast I've ever tried. My go-to was an egg sandwich on an English muffin with cheddar cheese and ham. I call it my DIY Egg McMuffin. My boyfriend would get the chili omelette, which I was not adventurous enough to try, but it seems great if you want to channel Daniel Boone. The shops. There just aren't many. Pappy and Harriet's is an iconic saloon with live music. The locals don't really go, but legends like Paul McCartney randomly pop in, so you've gotta do it. Book far in advance. What are the local specialties? Thrift stores (The End and Ricochet Vintage Wears are my favorites), hiking, herbal remedies, and, bizarrely, New York pizza. There are at least two great New York pizza joints — Rocky's New York Style Pizzeria (73737 29 Palms Hwy, Twentynine Palms) and Pie for the People. 1. Meal or meals: Hot wings and churros from Joshua Tree Saloon, with a root beer float in between as a palate cleanser. 2. 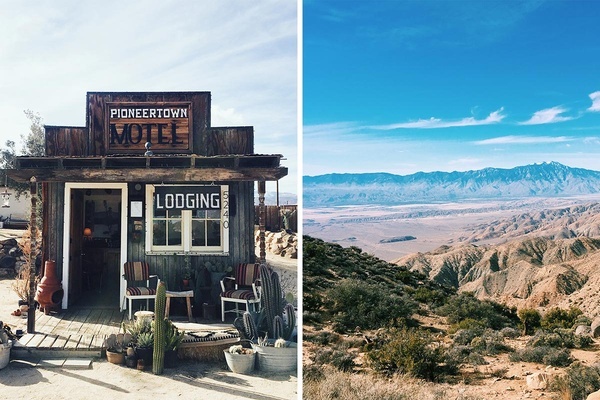 Neighborhood to explore: Pioneertown for the wild west vibes. 3. Site you did: Cholla Cactus Garden in the park is an insanely cool and vast natural cactus garden filled with clusters of tiny cholla cacti. The Integratron Sound Bath. It was closed for the whole month of January while I was in town, but I heard it's a must. 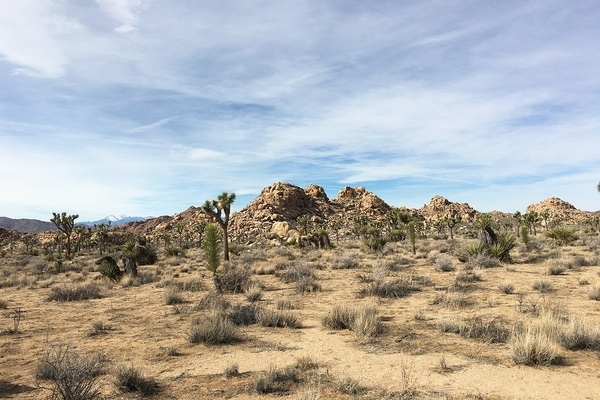 Every single person I talked to about Joshua Tree told me to go. It's a meditative session in a supposedly perfect acoustic structure where they play harmonic sounds that are so soothing, you feel like you're bathing in sound. Yup, it gets real hippie out there. From left: Pioneertown Motel; The lookout point at Keys View in Joshua Tree National Park. The food in Joshua Tree is surprisingly fantastic. It's not haute cuisine, but it is incredibly tasty and the ingredients are very fresh. Waking up to the view of endless, barren desert every morning, especially when I woke up in time to watch the sunrise. Pretty much everything. The sunsets, obviously. 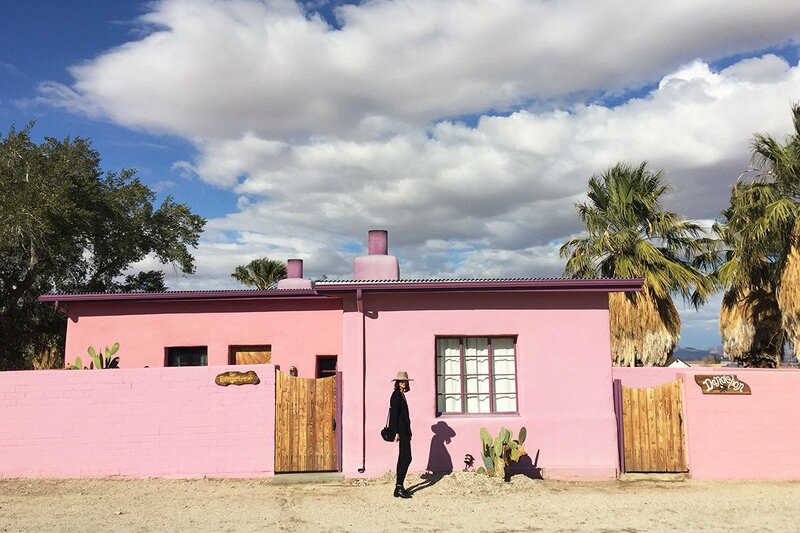 The bright pink bungalows at the 29 Palms Inn are a surefire way to break the internet. Stay somewhere with a lot of windows, like Casa 29 Palms, where the natural light and views are everything. Yes, it's my new favorite place. Nicole is the New York-based entrepreneur and designer behind denim line, Industry Standard. You can follow her at @nicolenajafi on Instagram and Twitter. She travels for the love of a good cocktail in a bar with a view.